Although mobile shelving technology has been around for some time, it hasn’t been until recently that significant consideration has been given to applying such systems to all realms of shelving. Now more than ever, business is cost conscious, and leveraging the ability to manage stock while strategically managing your space requirements, especially in lease environments where space is at premium and rent is high – equates to savings and the intelligent use of space. Mobile shelves have ideal applications as office filing systems (think architectural offices, a dentist or doctor’s office), archive box or document storage, or even in schools, but they’re flexible enough to have their benefits realized in any business, regardless of industry. Whether an office setting or a store room, the ability to move stock with limited activity and recoup up to 50% or more of your space is good for business. The principle of mobile shelving is straightforward and simple. Shelves that move and that do not require several access aisles. Shelving units are mounted on custom sized carts which sit on rails either embedded within your floor, or more commonly sitting on top of your existing floor. In this latter case, a raised deck of approximately 1 to 3 inches is built so that the top of the rails sit flush with the top of the deck; therefore eliminating a potential tripping hazard. This raised deck will have a sloped transition from the deck to your original floor all sitting within the perimeter of your shelving system. The carts that are now supporting your shelving will have a wheel directly linked to either your hand crank or a self contained motor. What was once one aisle for every back to back shelf will now become one aisle to be shared amongst 7 or 8 back to back shelves. 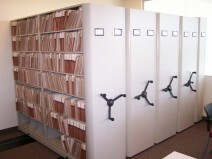 Mobile shelving systems are surface mounted and do not require additional building works or fixing to the floor. They can even be installed on tile floors. Installation is noise and dust free and quicker than most other systems, keeping disruption to your business to a minimum. These systems can also be tailored to your floor space for added elements of customization much easier then conventional shelving. This entry was posted in Shelving and tagged commercial shelving, industrial shelving, materials handling canada, mobile shelving, mobile shelving systems, pallet rack, push back racking, wrehouse storage. Bookmark the permalink.